"A Reasonable if Basic Introduction into Flaking"
A basic introduction into 'Flaking' and how to prevent it rather than a complete comprehensive guide on it. Has some good practical tips to get started with. This ebook is basically a summary introduction of Vin DiCarlo's No Flakes DVD course. It is given to you as a bonus when you buy "The Attraction Code". For the beginner, this provides some useful and practical tips into how to stop a women from flaking (i.e. cancelling on a date or meet you have planned together). None of it is very innovative or original, and you can read most of it in many other ebooks on the subject. Nonetheless, it will give you a reasonable introduction into the subject. Some of the more original advice it contains, are insights into "flaking precedence", how to use social commitments to help make sure she meets you, and the use of intrigue and escalating quickly. One thing I liked about this book is that it is pretty direct about what you have to do to prevent flaking in the first place - it doesn't give you a lot of information about the subject, but it does give you the broad lines of most of what makes the difference between a girl flaking and not flaking. There are some examples of text conversations and some texts to send. These were ok in quality - nothing great. But better than examples of texts given in David Wygant's Guy's Guide to Texting. The main downside to this ebook is simply that it doesn't provide enough information or detail about a lot of what is covered, and doesn't look at some important aspects of 'flake prevention' to really make it useful to you. This is likely Vin DiCarlo's marketing at work - to give you a good taster of what is in store if you buy the "No Flakes DVD program". This is a good bonus for the already good "The Attraction Code". It will give you some practical tips to better manage the issue of women 'flaking' on you. However, you should consider it a basic introduction into the subject rather than a complete comprehensive guide on it. The No Flakes! ebook provides a summary introduction to Vin DiCarlo's No Flakes approach to preventing women from flaking. 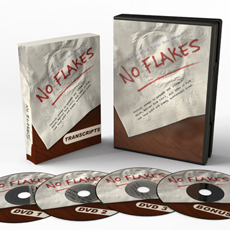 It is an ebook version of the No Flakes DVD program.